Nepenthes carunculata is a beautiful plant! I guess there's confusion over this species and N. bongso. I've asked different vendors if there is a difference between the two species but they tell me they don't have a definitive answer. Photos of N. bongso for sale look similar to N. carunculata and vice versa. Exotica Plants uses this name to identify the exact plant they use when they make their hybrids with N. carunculata var. robusta so there isn't confusion as to the parentage. There may be other N. carunculatas available that look almost identical to N. caruncualata var. "robusta" but if you want that exact plant, I believe it would have to be from the Exotica Plants clone. 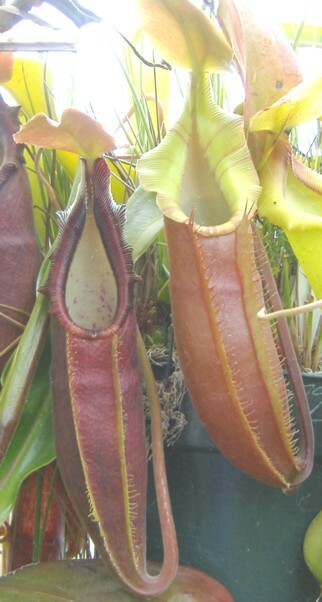 My N. bongso from Exotica Plants has produced a lower pitcher and it does look similar to this plant but not exactly. The lower pitchers are lighter at first and then really darken up as they mature. I've found that it is an easy going Nepenthes to grow as a highlander. It receives full sun and doesn't seem to mind.